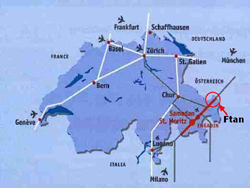 Arrival: The holiday region Ftan lower Engadin can be reached most simply and quickly by car or by public transport. The postbus from Scuol, whose schedule is harmonised with those of the trains from the lowlands, runs until late at night. Location: The Hotel Garni lies in a very quiet and sunny location (with a view upon the castle Tarasp) on the eastern outskirts of “Ftan-Pitschen”. 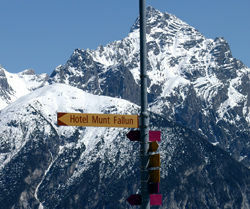 Its 8 minutes walking distance to the idyllic village centre with its bus-station, post-office, bank (cash dispenser) and to the cable car station which accesses the skiing region “Motta Naluns”. The local shop (Volg) and the bakery (Cantieni) are only 5 minutes away. Located at the beginning of a trail, its ideally situated as a starting point for hiking or biking tours. In winter arrival by car (ready for winter conditions) using the by-pass “Ftan-Pitschen” poses no problem.